"Polytonic" redirects here. For the musical term, see polytonality. Greek orthography has used a variety of diacritics starting in the Hellenistic period. The complex polytonic orthography notates Ancient Greek phonology. The simple monotonic orthography, introduced in 1982, corresponds to Modern Greek phonology, and requires only two diacritics. Polytonic orthography (from πολύς "much, many" and τόνος "accent") is the standard system for Ancient Greek and Medieval Greek. The acute accent (´), the grave accent (`), and the circumflex (ˆ) indicate different kinds of pitch accent. The rough breathing (῾) indicates the presence of the /h/ sound before a letter, while the smooth breathing (᾿) indicates the absence of /h/. Since in Modern Greek the pitch accent has been replaced by a dynamic accent, and the /h/ was lost, most polytonic diacritics have no phonetic significance, and merely reveal the underlying Ancient Greek etymology. Monotonic orthography (from μόνος "single" and τόνος "accent") is the standard system for Modern Greek. It retains two diacritics: a single accent or tonos (΄), which indicates stress and the diaeresis (¨), which usually indicates a hiatus but occasionally indicates a diphthong: compare modern Greek παϊδάκια (/pajˈðaca/, "lamb chops"), with a diphthong, and παιδάκια (/peˈðaca/, "little children") with a simple vowel. A tonos and a diaeresis can be combined on a single vowel to indicate a stressed vowel after a hiatus, as in the verb ταΐζω (/taˈizo/, "to feed"). Although it is not a diacritic, the hypodiastole (comma) has in a similar way the function of a sound-changing diacritic in a handful of Greek words, principally distinguishing ό,τι (ó,ti, "whatever") from ότι (óti, "that"). The Lord's Prayer in a 4th-century uncial manuscript Codex Sinaiticus, before the adoption of minuscule polytonic. Note spelling errors: elthatō ē basilia (ΕΛΘΑΤΩΗΒΑΣΙΛΙΑ) instead of elthetō ē basileia (ΕΛΘΕΤΩ Η ΒΑΣΙΛΕΙΑ). The original Greek alphabet did not have any diacritics. The Greek alphabet is attested since the 8th century BC. Until 403 BC, variations of the Greek alphabet—which exclusively used what is now known as capitals —were used in different cities and areas. From 403 on, the Athenians decided to employ a version of the Ionian alphabet. With the spread of Koine Greek, a continuation of the Attic dialect, the Ionic alphabet superseded more or less quickly the other alphabets, called epichoric. The Ionian alphabet, however, was also made up only of capitals. The rough and smooth breathings were introduced in classical times in order to represent the presence or absence of an /h/ in Attic Greek, which had adopted a form of the alphabet in which the letter Η (eta) was no longer available for this purpose as it was used to represent the long vowel /ɛː/. During the Hellenistic period (3rd century BC), Aristophanes of Byzantium introduced the breathings—marks of aspiration (the aspiration however being already noted on certain inscriptions, not by means of diacritics but by regular letters or modified letters) and the accents, of which the use started to spread, to become standard in the Middle Ages. It was not until the 2nd century AD that the accents and breathings appeared sporadically in the papyri. The need for the diacritics arose from the gradual divergence between spelling and pronunciation. The majuscule, i.e. a system where text is written entirely in capital letters, was used until the 8th century, when the minuscule polytonic supplanted it. 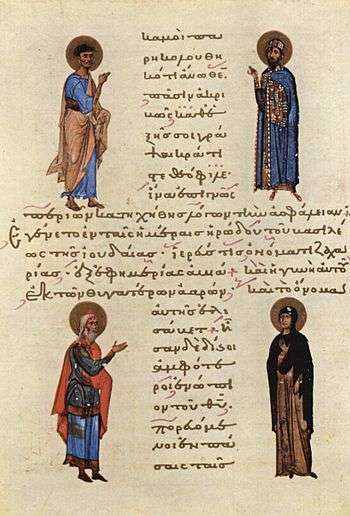 By the Byzantine period, the modern rule which turns an acute accent (oxeia) on the last syllable into a grave accent (bareia)—except before a punctuation sign or an enclitic—had been firmly established. Certain authors have argued that the grave originally denoted the absence of accent; the modern rule is, in their view, a purely orthographic convention. Originally certain proclitic words lost their accent before another word and received the grave, and later this was generalized to all words in the orthography. Others, drawing e.g. on evidence from Ancient Greek music, consider that the grave was "linguistically real" and expressed a word-final modification of the acute pitch. In the later development of the language, the ancient pitch accent was replaced by an intensity or stress accent, making the three types of accent identical, and the /h/ sound became silent. At the beginning of the 20th century (official since the 1960s), the grave was replaced by the acute, and the iota subscript and the breathings on the rho were abolished, except in printed texts. Greek typewriters from that era did not have keys for the grave accent or the iota subscript, and these diacritics were also not taught in primary schools where instruction was in Demotic. Following the official adoption of the Demotic form of the language, the monotonic orthography was imposed by law in 1982. The latter uses only the acute accent (or sometimes a vertical bar intentionally distinct from any of the traditional accents) and diaeresis and omits the breathings. This simplification has been criticized on the grounds that polytonic orthography provides a cultural link to the past. Some individuals, institutions, and publishers continue to prefer the polytonic system (with or without grave accent), though an official reintroduction of the polytonic system does not seem probable. The Greek Orthodox church, for example, continues to use polytonic orthography, and some books and the daily newspaper Estia are still published in polytonic, especially those few still written in Katharevousa. Though the polytonic system was not used in Classical Greece, these critics argue that modern Greek, as a continuation of Byzantine and post-medieval Greek, should continue their writing conventions. Some textbooks of Ancient Greek for foreigners have retained the breathings, but dropped all the accents in order to simplify the task for the learner. Polytonic Greek uses many different diacritics in several categories. At the time of Ancient Greek, each of these marked a significant distinction in pronunciation. Monotonic orthography for Modern Greek uses only two diacritics, the tonos and diaeresis (sometimes used in combination) that have significance in pronunciation. Initial /h/ is no longer pronounced, and so the rough and smooth breathings are no longer necessary. The unique pitch patterns of the three accents have disappeared, and only a stress accent remains. The iota subscript was a diacritic invented to mark an etymological vowel that was no longer pronounced, so it was dispensed with as well. The transliteration of the Greek names follows Latin transliteration of Ancient Greek; modern transliteration is different, and does not distinguish many letters and digraphs that have merged by iotacism. The accents (Ancient Greek: τόνοι tónoi, singular τόνος) are placed on an accented vowel or on the last of the two vowels of a diphthong (ά, but αί) and indicated pitch patterns in Ancient Greek. The precise nature of the patterns is not certain, but the general nature of each is known. The acute accent (Ancient Greek: ὀξεῖα oxeîa "sharp" or "high") — ά — marked high pitch on a short vowel or rising pitch on a long vowel. The acute is also used on the last of two (or occasionally three) successive vowels in Modern Greek to indicate that they are pronounced together as a stressed diphthong. The grave accent (Ancient Greek: βαρεῖα bareîa "heavy" or "low", modern varia) — ὰ — marked normal or low pitch. The grave was originally written on all unaccented syllables, but now only replaces the acute at the end of a word if another accented word follows immediately without punctuation. The circumflex (Ancient Greek: περισπωμένη perispōménē "twisted around") – ᾶ — marked high and falling pitch within one syllable. In distinction to the angled Latin circumflex, the Greek circumflex is printed in the form of either a tilde or an inverted breve. It was also known as ὀξύβαρυς oxýbarys "high-low" or "acute-grave", and its original form (like a caret: ^ ) was from a combining of the acute and grave diacritics. Because of its compound nature, it only appeared on long vowels or diphthongs. The breathings were written over a vowel or r.
The rough breathing (Ancient Greek: δασὺ πνεῦμα dasù pneûma; Latin spiritus asper)—ἁ—indicates a voiceless glottal fricative (/h/) before the vowel in Ancient Greek. In Greek grammar, this is known as aspiration. This is different from aspiration in phonetics, which applies to consonants, not vowels. Rho (Ρρ) at the beginning of a word always takes rough breathing, probably marking unvoiced pronunciation. In Latin, this was transcribed as rh. Upsilon (Υυ) at the beginning of a word always takes rough breathing. Thus, words from Greek begin with hy-, never with y-. The smooth breathing (Ancient Greek: ψιλὸν πνεῦμα psilòn pneûma; Latin spiritus lenis)—ἀ—marked the absence of /h/. A double rho in the middle of a word was originally written with smooth breathing on the first rho and rough breathing on the second one (διάῤῥοια). In Latin, this was transcribed as rrh (diarrhoea or diarrhea). The coronis (Ancient Greek: κορωνίς korōnís "curved") marks a vowel contracted by crasis. It was formerly an apostrophe placed after the contracted vowel, but is now placed over the vowel and is identical to the smooth breathing. Unlike the smooth breathing, it often occurs inside a word. The iota subscript (Ancient Greek: ὑπογεγραμμένη hypogegramménē "written under")—ᾳ—is placed under the long vowels ᾱ, η, and ω to mark the ancient long diphthongs ᾱι, ηι, and ωι, in which the ι is no longer pronounced. Next to a capital, the iota subscript is usually written as a lower-case letter (Αι), in which case it is called iota adscript (Ancient Greek: προσγεγραμμένη prosgegramménē "written next to"). In Ancient Greek, the diaeresis (Greek: διαίρεσις or διαλυτικά)—ϊ—appears on the letters ι and υ to show that a pair of vowel letters is pronounced separately, rather than as a diphthong. In Modern Greek, the diaeresis usually indicates that two successive vowels are pronounced separately (as in κοροϊδεύω (/ko.ro.iˈðe.vo/, "I trick, mock")), but occasionally, it marks vowels that are pronounced together as an unstressed diphthong rather than as a digraph (as in μποϊκοτάρω (/boj.koˈtar.o/, "I boycott")). The distinction between two separate vowels and a diphthong is not always clear, although two separate vowels are far more common. The diaeresis can be combined with the acute, grave and circumflex but never with breathings, since the letter with the diaeresis cannot be the first vowel of the word. In Modern Greek, the combination of the acute and diaeresis indicates a stressed vowel after a hiatus. In textbooks and dictionaries of Ancient Greek, the macron—ᾱ—and breve—ᾰ—are often used over α, ι, and υ to indicate that it is long or short, respectively. The diacritics are written above lower-case letters and at the upper left of capital letters. In the case of a diphthong or a digraph, the second vowel takes the diacritics. A breathing diacritic is written to the left of an acute or grave accent but below a circumflex. Accents are written above a diaeresis or between its two dots. When a word is written entirely in capital letters, diacritics are far less used; the word Ἢ (or), is an exception to this rule because of the need to distinguish it from the nominative feminine article Η. Diacritics can be found above capital letters in medieval texts. The diaeresis is always written. There have been problems in representing polytonic Greek on computers, and in displaying polytonic Greek on computer screens and printouts, but these have largely been overcome by the advent of Unicode and appropriate fonts. ➔ U+03B1 GREEK SMALL LETTER ALPHA, U+0301 COMBINING ACUTE ACCENT. Below are the accented characters provided in Unicode. In the uppercase letters, the iota adscript may appear as subscript depending on font. ↑ Nicolas, Nick. "Greek Unicode Issues: Punctuation". 2005. Accessed 7 Oct 2014. ↑ Probert, Philomen (2006). Ancient Greek accentuation. New York: Oxford University Press. p. 59. ISBN 9780199279609. ↑ Devine, Andrew M.; Stephens, Laurence D. (1994). The prosody of Greek speech. New York: Oxford University Press. p. 180. ISBN 0-19-508546-9. ↑ Allen, William S. (1987). Vox graeca. London: Cambridge University Press. pp. 124–130. ↑ Betts, G. (2004). Teach Yourself New Testament Greek. London: Teach Yourself Books. ISBN 0-340-87084-2. ↑ Abbott, Evelyn; Mansfield, E. D. (1977). A Primer of Greek Grammar. London: Duckworth. p. 14. ISBN 0-7156-1258-1. Panayotakis, Nicolaos M. (1996). "A Watershed in the History of Greek Script: Abolishing the Polytonic". In Macrakis, Michael S. Greek Letters: From Tablets to Pixels. New Castle, DE: Oak Knoll Press. ISBN 1-884718-27-2. Panayotakis is critical of the adoption of monotonic, and also provides a useful historical sketch. Google Docs guide for Linux Covers installation of layouts, use of dead-keys etc. Updated to 2010.